UK-based Chetwood Architects just unveiled plans for the Phoenix Towers in Wuhan, China, which will be the world’s tallest pair of skyscrapers upon completion. The supertall structures are the centerpiece of the firm’s four master plans slated for construction in China. 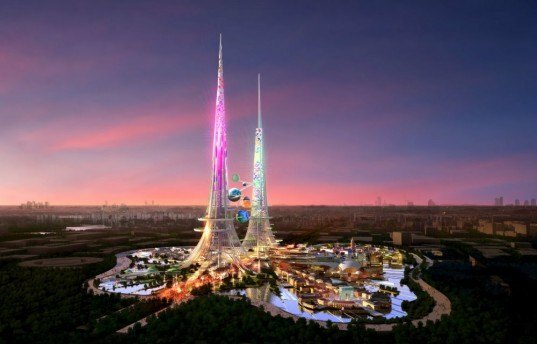 The Phoenix Towers are outfitted with wind turbines, solar panels, thermal chimneys and rainwater harvesting systems and they will act as an “environmental catalyst” to re-invigorate the city of Wuhan. The Phoenix Towers, designed in cooperation between Chetwood Architects and HuaYan Group, are expected to be built on a 47-hectare site on an island within a lake in the city of Wuhan in China. They are expected to reach the height of 1km, catching up with Adrian Smith + Gordon Gill Architecture-designed Kingdom Tower in Jeddah; they would be the tallest pair of towers in the world. 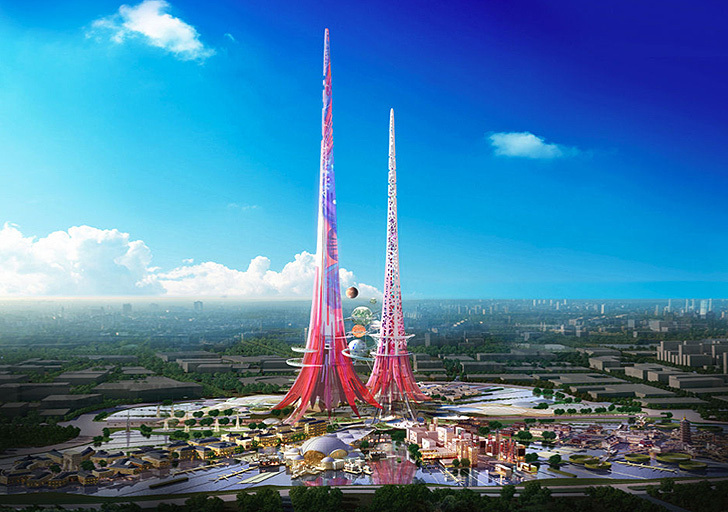 Inspired by the symbol of the Chinese Phoenix, which combines male and female principles in perfect balance, the architects designed two interdependent towers. The “male” one (Feng) feeds the “female” (Huang) with renewable energy and together they act as a beacon of sustainability in the area. Of course, the only thing wrong with the photo is the missing smog and the fact that most of the landscape is grey / dirty. This is a grand idea just as Phoenix is on the threshold of becoming a ghost town as the water dries up. Can't they think of a better use for those dollars? isn\\\'t a priority to switch all those coal energy plants to green energy first? people can\\\'t breath clean air anymore. These buildings are going to take a while to build and when they are ready people won\\\'t care that much if they are getting sick, more and more.